Miami is mainly known for its white beaches, modern shopping opportunities and high-class dining experiences. But you don’t necessarily need deep pockets to explore the destination. To make Danish travelers aware of this, Related invited the Danish travel magazine REJSER to explore Greater Miami and the Beaches on a pan-European press trip under the banner of “Miami Bling on a Budget”. During this trip, the journalist – together with a group of European journalists – got to experience both the white sands of South Beach and the hip Wynwood Arts District as well as the Latin culture of Little Havana and the colorful Art Deco district. 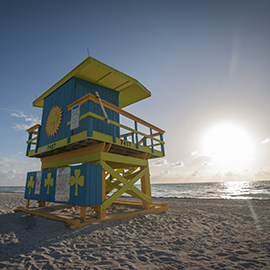 The tour began in Miami Beach, which offers more than its fair share of activities to enjoy on a slim budget! Moving over to the mainland, the group explored Little Havana where it is rumored that one could spend a full day without hearing a word of English spoken. Saturated with Cuban culture, Little Havana’s main thoroughfare, Calle Ocho, is lined with comfort food restaurants featuring Latin specialties, and it is common to see cafes where people sip cafecitos, play dominos and argue about politics all day. The neighboring Wynwood Arts District is home to dozens of museums, galleries, warehouses and exhibition spaces. This emerging neighborhood is also home to the amazing Wynwood Walls, an open-air park dedicated to cutting-edge museum-quality contemporary urban murals. In Downtown Miami, they also got to visit both the new Patricia and Phillip Frost Museum of Science and its neighbor, the modern and contemporary art museum Pérez Art Museum Miami. The press trip resulted in a nice 2½-page article with an advertorial value of over 125,000 USD – reaching 360,000 Danes.